Style #T4357 Make your usual pajamas more stylish and more functional with the Moisture-wicking Kristi Capri Women's Travel Pajamas from Cool-jams™. This complete ladies' sleepwear set comes with a laid-back T-shirt with a V-neck and white lace around the edges(for added comfort the accent lace is stitched so it does not touch the skin), as well as matching capri pants with an adjustable elastic waist. Because both pieces are made of our unique Cool-jams™ performance fabric technology woven throughout the soft, silky fabric, they help to wick away moisture from your skin while you sleep. Our Moisture-wicking Kristi Capri Women's Travel Pajamas is also very wrinkle-resistant and lightweight, making it the perfect set for travel. Whether you struggle with night sweats due to menopause, cancer treatments or another health issue, this understated ladies' pajama set will give you a good night's sleep that's free of uncomfortable moisture. They even eliminate the bacteria that cause body odor to leave you feeling fresh. The most important measurements on the size chart are hip and bust. Pant inseam length 21". Women's travel pajamas weight approximately 9 oz. Wash your ladies' sleepwear set in cool or warm water on gentle cycle. Never use fabric softener or fabric softener sheets because it will minimize the wicking properties of the fabric. If you accidentally use fabric softeners, re-wash the women's travel pajamas in clear water to remove softener residue, so the wicking properties will return to maximum effectiveness. Lay your ladies' sleepwear set flat or hang to dry. 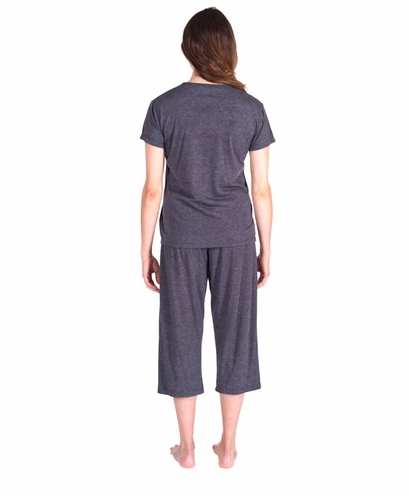 Tumble drying won't damage the women's travel pajamas, but can sometimes create static. I love my capri pajamas. I usually always wear medium but i thought i would order large so they are loose. These capris ran small so the large fit! You will need to go up a size to make these work and they are terrific! Would recommend just go up a size! Perfect traveling PJs. Wash them in the hotel sink, squeeze out in a towel, hang them, and they're dry in a couple of hours. The clothes themselves were nice, but definately not true to size. I have returned them and will not be purchasing again. Merchant's comment: So sorry that the garment did not fit you correctly. Most customers report that our garments fit very true to size. We see that you ordered a size 2X. Perhaps you required a size 3X which is available in this style. We do our best to fit our garments to all sized men and women. So sorry we did not get it right for you. Perhaps you would have better success with some of our nightgowns which are not as fitted as PJS. This is my second pair of Cool-Jams. They are extremely comfortable and live up to their moisture-wicking advertising. The only reason I gave this pair 4 stars, instead of 5, is that I'm not as crazy about the style as my first pair, which has a round collar and some pleat details on the top that give it a little more pizzaz. But I still love these, too. Thanks, Cool-Jams. Also, thanks for advertising on the Satellite Sisters podcast. I wouldn't have heard of you otherwise. Recommendation by a friend led me to Cool Jams. I have chemo induced hot flashes and my Kristina wicking Capri set of pjs have been a great help. They are soft and comfortable. As advertised they keep me from getting clammy during the night. I�ll be ordering another pair soon! These are the most wonderful p.j.s. I have a set in lavender and they work like they say. I have laundered them and they are perfect. I am ordering another set in the aqua. Thank you for a wonderful product. I am sleeping so much better. These are light weight & so comfortable! I purchased Cool-jams as a gift to my wife, and she was very pleased! She stated that they afford her a good, comfortable night's sleep. Now, if we could only quiet our cat in the middle of the night . . . These are very soft and comfy. They are however a bit snug for the sizing. I would love more in the 3-4x range for pajamas and a short robe! Great customer service. These feel great but do run small. I love the feel! I ordered my size but the fit was too snug. These run small. I was so excited to find pajamas especially for hot sleepers. I can't sleep if I'm hot, which is most of the time, so these have been a blessing! I love these and plan to order more soon! I bought them for my mom who is having night sweats due to chemotherapy and she loves them. They have made her sleeping so much better. Very smooth ordering experience - pajamas arrived very quickly. The material is very nice and soft - comfortable to sleep in. I got the set to travel and my main concern is how quickly they dry after just wringing them out by hand in the sink. From the washing machine, they dried quickly and look like new. My only question would be the "relaxed elastic waistband" that "accommodates up to 4'' larger waist size." I'm a medium and my measurements were easily within the Medium description and I don't find much extra room in the waistband. It's fine, but there isn't a comfortable 4 extra inches. So if someone is at the top end of the measurements, she should go up a size. I love Cool Jams for travel - not only are they cool and comfortable, but they are light-weight, don't take up much space, and dry quickly. I ordered two capri pajama sets. The material is excellent--it's like wearing nothing at all! Doesn't bunch up, doesn't absorb moisture, very light weight, very comfortable. I do wish it was a little more affordable. I love these PJs! I have the hardest time sleeping when I'm hot but these truly are comfortable all through the night. I think I'll buy more. I absolutely love the set. I was looking for PJ's that were breathable and kept me dry all night (night sweats are awful). They did the trick. I order the the small and they are true to size. If you want a little more room then go a size up. I will be ordering the short set for the summer. Wish they had different colors. I had my doubts as to how good these could work. But I was proven wrong. These work amazing. I am able to sleep so much better. Soft, comfy and do not sweat in them! These are the perfect pajamas, light weight, loose but not baggy and they wash beautifully. I love these--and am already ordering another pair and am planning on getting rid of other pajamas that just don't measure up. These are soft, comfortable, feel nice on my skin, are still comfortable when I have night sweats. I've been using a couple of sets for a while now. They are very soft and definitely help make me more comfortable at night. However, they retain some body odor...otherwise they're great. Merchant's comment: Wicking products will retain an odor if not washed with scented detergent. We also recommend soaking in a solution of baking soda and water every now and then before washing to bring out the freshness. I was surprised at how well they fit and how soft and luxurious they are. Lilac is also a very pretty color. Thank you for making such a great product! Wonderful works great for my night sweats. I've got to admit that I've tried all kinds of products labeled as moisture wicking and these are the only ones that I like. All the other products either didn't work or felt like polyester. These are amazing they are soft and feel like cotton. I'm a fan for sure. Cool and stylish. These pajamas have helped me sleep better which is godsend when you've been suffering from insomnia for as long as I have.